Sleep apnea is a common condition with symptoms that include sleep loss, loud snoring, bad headaches, and exhaustion throughout the day. 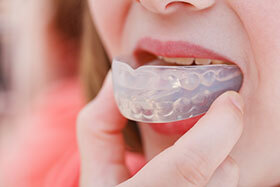 If you or someone you’re with suffer from loud snoring or sleep apnea, Dr. Marvizi here in Long Beach can give you the relief you need with a custom fit Oral Appliance. Here in the Bixby Knolls area of Long Beach, Dr. Marvizi has helped hundreds of people who have suffered from sleep apnea and snoring and can help you as well. Fitting you with custom oral appliance will ensure that your jaw and tongue stay in their proper alignment, preventing the restriction of breathing and giving you the ability to sleep soundly through the night. You wear the device all night long, and don’t worry — after the first night or two, you’ll hardly even notice it’s there. Don’t put it off and give us a call today at 562.595.4123 to get the relief you need!